"When one reads books, he/she starts living it and identifies (or not) with main hero. 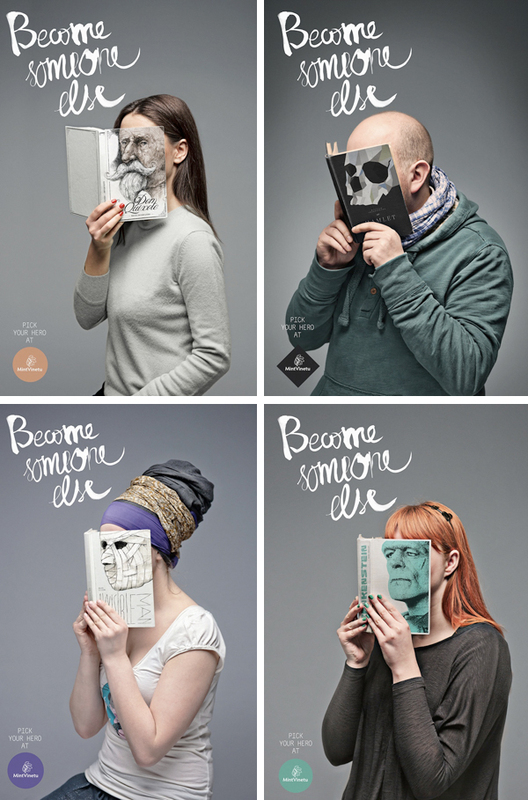 These print ads for the Mint Vinetu bookstore, which sells lots of classics, focuses on the idea of becoming someone else. And provokes people to try on different personas." I recently thumbed through this book which has moved Don Quixote to the top of my reading list - sadly, I've never actually read it have you? There are so many classics I have yet to read! What classics are your favorite? How many have you read? I'm working on reading the whole Barnes and Noble Classics list. It's about 200 books. I've read a few for high school and college and a few for fun. I'm really getting a new appreciation for the classics. These look so fun! I am going to take a course in literary masterpieces this summer at my local university just to get me acquainted with the classics I've never read. I'm looking forward to it. This ad campaign is a cool concept. Great idea, I love it! Classics are pretty great, I just finished the Razor's Edge which wasn't that great but I of course loved Pride and Prejudice and Sense and Sensibility. Also the Secret Garden, Alice in Wonderland are pretty great! Reading is amazing! Wow! What a great idea! I love the classics. I read so many of them growing up. Austen, Dickens, Alcott, Bronte... those are some of my favorite authors. I also really recommend the abridged version of Les Miserables. One of my favorite books ever. My husband even LOVED it, and he isn't that into the classics in general. I suggest the abridged version because the style of writing in that day focused on all the minute details and would spend chapters on the stuff. Basically, you're reading a history book. There's still plenty of meat in the abridged version. Another classic that was so fascinating: The Jungle by Upton Sinclair. Gosh I have already been adding music to my itunes based on your posts, and now I'll be adding books to my collection! The Well-Educated Mind looks fascinating. I've started reading lots of classics now that I have a kindle and most are free! I've read quite a few already but my favorites are Sherlock Holmes, Treasure Island, and Emma. I'm not sure if these texts are considered classics, but I love anything/everything by Aldous Huxley, Albert Camus, and Evelyn Waugh. Three of my favorite classics are Hermann Hesse's Demian, D. H. Lawrence's Lady Chatterley's Lover, and Kate Chopin's The Awakening. Such a cool and different campaign, really love the pictures! I mainly read classic novels during my high-school time and my favorite is "Great Expactations" from Charles Dickens! how amazing are these?!? trying to work out who I'd most like to 'be' whilst getting lost in my book! i completely agree with that statement. i find myself always identifying (and almost becoming) the main character. i love the great gatsby...and i will never tire of jane eyre! i'd love to read more, as i feel like i haven't read nearly as much as i want! Oooh, that is just fantastic!!! So many classics were required reading when I was young, and as a young student I would begrudgingly read them. It would be such a great idea to revisit them as an adult without the pressure of having to have to read them for school! Love those covers! I used to read a lot of classics for fun - couldn't get into current fiction for some reason. Then I did and for years have read nothing but, but now I'm heading back to the classics for so many that I've missed like Don Quixote! Amazingly I've never read any Austen or Bronte books either! I've loved Catcher in the Rye, To Kill a Mockingbird, Great Expectations, Brave New World, and anything Hemmingway. Super smart - great concept and beautiful execution, befitting an indie bookstore. Love it! this campaign is genius. i haven't read a ton of the classics but i know one that i won't be reading again is wuthering heights. it was torture in high school english. i've been scarred for life! This is beyond cool. I love the imagery you post here! "Be someone else" A perfect caption! fantastic! just how I feel when I read. Anna Karenina is my favorite, along with Frankenstein. I'd love to read Don Q., my favorite play. Oh wow! Clever concept indeed! I love this campaign! Just wanted to pop in and say how much I enjoy your blog! These are amazing. This would be the greatest purchase ever! growing up, i was the biggest bookworm around...loved to go to the library. about age 10, my dad made a pact with me. i could checkout any book in the library, no questions asked (hello, forever amber & beulah land...)thew in a promise to take me to the library as many times a week as i wanted, BUT, i had to agree to read one book a week chosen by him. because of my dad, i read so many (probably boy centric) classics that i would never even looked at--most of jules verne, treasure island, swiss family robinson, sherlock holmes... too many to list. he also helped me find jane austen, the bronte sisters, the fabulous wizard of oz series, the albert payson terhune cry-your-eyes-out dog series...and so many, many other wonderful books which fall under the scarey "classic" label, but which are still great reads..
Too hard to narrow it down to just one! definitely pride and prejudice, gone with the wind, the great gatsby, a tree grows in brooklyn. That's almost too much fun! People everywhere are going to turn off their comps, step outside and start reading?! Don Quixote is one of my absolute favorite books. Everyone who has posted a comment should read it. It's tough in the very beginning but then so rewarding and beautiful.